Kniphofia ‘Fiery Fred' is a distinctive taller growing unusual border perennial with orange-red flower spikes on erect stems. Leaves are narrow, long, and grass-like. This is a sturdy, but graceful plant with few problems and an architectural character. This variety has won the prestigious Award of Garden Merit as an outstanding garden plant by the Royal Horticultural Society. 100cm. 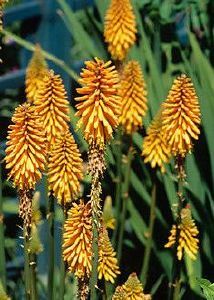 Kniphofia ‘Fiery Fred’ grows in soils ranging from a pH of 6 (acidic ranges from 5.6 to 6) to 7.8 (slightly alkaline ranges from 7.6 to 8). It is adapted to loam, sand, clay loam, loamy sand, sandy clay loam and sandy loam soils, and prefers high fertility. 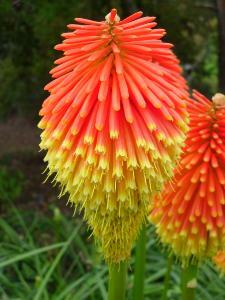 Uses: Kniphofia ‘Fiery Fred’ is perfect for sunny perennial borders or grown in amongst mixed shrub plantings.